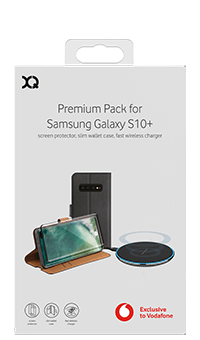 With glass screen protector, stylish wallet case and wireless charger, the XQISIT Premium Accessory Bundle Pack has the essentials you need to enhance your Samsung experience. Keep your Samsung S10+ screen pristine and free from cracks or scratches with XQISIT's curved PET film Screen Protector. At just 0.15mm thick, the impact-resistant, ultra-clear surface protects your phone without affecting your touchscreen experience. XQISIT's Black Slim Wallet Selection Case for Samsung S10+ has an elegant, leather-look exterior which opens to reveal space for your cards, and conceals a strong, protective inner shell. It folds into a stand too, so you can watch your videos effortlessly. Freely place your Samsung S10+ onto XQISIT's Fast Wireless Charger to charge ? no need to lock into position. With inductive charge technology and 10W output, this classic-look charger is sustainable too ? with auto shutdown and ultra-low standby power.